Eating candy for dinner. Jumping on the bed. Dating that guy with all those tattoos and a motorcycle. There were plenty of things we were forbidden from doing growing up. Now that we’re all adults here, we can finally start indulging in a few “forbidden fruits”. Take this delectable dessert, for example. Fresh from our Spring Menus, we’re bringing you a dessert that’s just the right amount of wrong. I’m talking a vegan, gluten free, just-sweet-enough, Forbidden Rice Pudding. We had the privledge of sampling this recipe at a recent Cookbook Club, and let my tell you: YUM. It had me feeling like I had escaped the office for a tropical Spring Break vacation. Make Rice: Place the rice and water in a heavy pot and bring to a boil. Once boiling, let the rice boil vigorously for 10 minutes, stirring frequently. After 10 minutes, cover, turn heat to low, and cook for 15 to 20 minutes or until tender but still al dente. Heat Coconut Milk: Place the coconut milk in a saucepan over medium heat. Add the sugar, salt and lime zest and stir until sugar is completely dissolved and milk is hot. Increase heat and boil milk until reduce by half. Divide the reduced milk into two, half to finish the rice and half to be used as a sauce. Add Milk to Rice: When the rice has cooked, pour half of the reduced milk into the rice pot. Stir rice pudding and simmer, uncovered, until the liquid is absorbed. Turn off flame and set aside until ready to serve. Make Caramel: Spray a sheet pan and an offset spatula with nonstick spray or line pan with a silicon mat. Set aside. Combine sugar, water and cream of tartar in a saucepan. DO NOT STIR. Bring to a boil and cook until the sugar starts to just turn light gold. At this point, with a heat proof rubber spatula or wooden spoon, gently mix in the sesame seeds. Cook the mixture just until the sesame seeds start to toast. Immediately turn mixture out onto the prepared pan. Quickly spread mixture out as thinly as possible using the oiled offset spatula. Let praline cool completely. Once cool, break the praline into large shards for plated desserts or small shards if you are making mini desserts. Prepare Mangoes: Peel the mangoes. Slice the mango flesh off the pit as cleanly as possible. Lay each mango half flat and slice crosswise, then, cut the slices into small dice. Assemble: Divide the pudding between the serving vessels. Pro Tip: This dessert looks awesome in wine glasses or old fashion glasses! 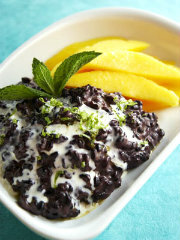 Drizzle the tops of the rice with the coconut milk sauce. 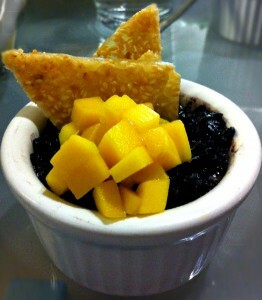 Evenly divide the mango on top and garnish with a shard of the sesame praline and sprig of mint (optional). Serve warm or at room temperature. Recipe adapted by Parties That Cook® | www.PartiesThatCook.com from Hot Sour Salty Sweet, 2000.